Do you ever worry about saying the wrong thing to someone who’s suffering? I do. I desperately want to say something meaningful, comforting, and helpful. But often those words evade me. I get nervous and chatty, and the next thing I know, I’ve said something I regret. When I battled a rare cancer several years ago, I watched friends struggle for the right words to say. I felt the sting of the occasional awkward or unhelpful comment. And even though I continue to put my foot in my mouth regularly, I have learned several phrases to avoid when supporting a friend with cancer. None of us is the perfect friend, and we will all say the wrong thing from time to time. I don’t want this list to cause you more worry, but I hope it will give you some ideas about how to better encourage your friend with your words. These are often the first words that fly out of our mouths when a friend is hurting. There’s nothing hurtful or inappropriate about this sentiment, but I’d like to suggest an alternative. Your friend is overwhelmed by her cancer diagnosis and all its life-changing implications. It will be difficult for her to consider her needs, guess what you’re willing to do, and then reach out and ask you for help. Say this instead: “Can I bring you a meal next Monday?” You’ll better serve your friend if you make a specific offer of help, letting her know a task you can help with or a time you’re available. This question also came across as curious rather than caring. It didn’t show concern for how I felt right then. Your friend will feel more loved and supported if your concern focuses on how she’s doing now rather than asking her to relive how she got here. This is true. It’s straight out of the Bible—in fact, it is one of my favorite verses. Romans 8:28 says, “And we know that for those who love God all things work together for good, for those who are called according to his purpose” (ESV). This verse brings me comfort in difficult circumstances, but it doesn’t promise that I will escape pain, heartbreak, grief, and loss in this life. Do this instead: Let your friend know that you’re a safe place for her to share her struggles, fears, and doubts. When you share Scripture, I recommend choosing verses that communicate God’s presence with her and care for her in her suffering. If your friend needs breast reconstruction due to cancer, her experience will be vastly different from elective plastic surgery. Remember, your friend didn’t choose to have this surgery! No matter how bravely your friend jokes about her visits to the plastic surgeon, please remember that losing one or both breasts is excruciatingly difficult—physically and emotionally. She will probably endure multiple surgeries, and in the end she will look different than she did before cancer. She will need to grieve the loss of her pre-cancer body. Watching all the hair on your head fall out is almost as traumatic as being told you have cancer. It starts coming out in fistfuls in the shower; you find giant clumps of hair on your pillow in the morning. You dread the day when you can’t hide the bald spots anymore and will have to shave the sparse remains. Yes, it’s just hair. And yes, it will grow back. But it will probably take years for your friend to regain her pre-cancer hairstyle. In the meantime, her baldness and short hair will be a constant reminder of all she’s endured. I know you mean well and that you desperately want to find information that will help your friend. But you can rest assured that she has an entire team of doctors and other medical personnel working to heal her. When I had cancer, I had so many doctors I couldn’t even remember all their names. If you add up the years of education and training they had, it was probably more years than I’ve been alive. You can let her doctors be the doctors, and you can focus on being her friend. Unless she asks for your help, trust your friend to do her own research if she chooses. Do this instead: Take the time to find out the details of your friend’s medical treatment. Learn the names of her doctors and nurses, pray for wisdom for them, and listen closely when your friend shares updates. When I finished treatment and had no evidence of disease anymore, most people celebrated and assumed I was back to normal. I was immensely grateful to be done with my almost-daily encounters with doctors, needles, and pills, and even more grateful to have survived. But nothing about post-cancer life seemed normal, and I wasn’t sure it ever would be. Your friend may struggle with fatigue, chemo brain, additional surgeries, and her changed body. She will need months or, more likely, years to process the trauma and implications of her diagnosis. Life after cancer is never the same. I hope the next time you see your friend, you will feel equipped to speak words of encouragement and support. If you still feel unsure about what to say, just listen. Your presence with your friend powerfully communicates support even if you don’t say a word. 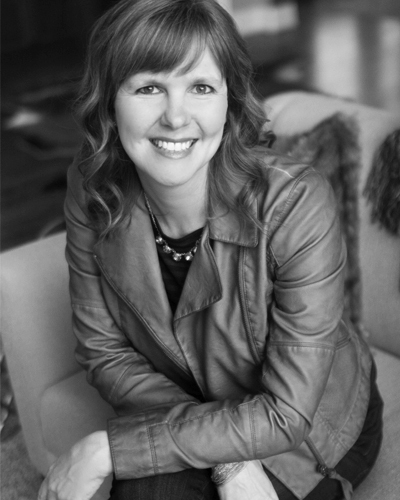 Marissa Henley, author of Loving Your Friend Through Cancer: Moving Beyond “I’m Sorry” to Meaningful Support , is herself a cancer survivor who writes and speaks about faith, friendship, God’s character, and suffering. She lives in Arkansas with her husband, three children, and one disobedient dog. She would love to connect with you at www.marissahenley.com. 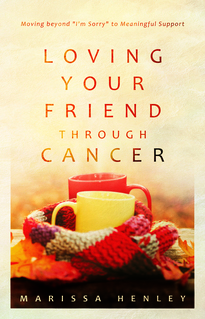 In honor of October being Breast Cancer Awareness month, we are offering 50% off Marissa Henley’s book Loving Your Friend Through Cancer: Moving Beyond “I’m Sorry” to Meaningful Support. Use the coupon code PINK at check-out and get this extremely encouraging resource that will help you navigate the difficulties of helping your loved one who is struggling with cancer. Coupon code is good until October 31, 2018, at midnight. I have had and do have people in my life in treatment for cancer. I attended the Life Giving Leadership conference last week and acquired this book by Marissa Henley. I look forward to reading it and applying the insight she shared to my interactions with those who are suffering with illnesses. This blog post has caused me to take pause and evaluate a few things in regard to how I interact with someone suffering. Thank you.